Sensual, warm, elegant, Habit Rouge was conceived by master perfumer Jean Paul Guerlain in 1965 when faced with a surprising and novel problem. Men who loved Shalimar perfume on their wives and lovers wanted a comparable powdery composition translated into a virile structure they would claim as their own. Thus Habit Rouge was born, the name alluding to the red jacket landed gentry loved to don on hunting days in the countryside and henceforth adopted for riding competitions. Guerlain of course wasn't the first to associate horses with perfumes: Hermes was there before (beginning as saddlers), but it set an example for others later on, namely Ralph Lauren. The important thing is Habit Rouge quickly became a Guerlain classic, the exact antithesis of Guerlain's Vetiver in spirit and stance; a concept best encapsulated in a vintage ad proclaiming: "The Body, The Soul, a Guerlain cologne is for both" where the scents are described thus: "the agressive boldness of Habit Rouge, the understated elegance of Imperiale, or the subtle, penetrating depths of Vetiver". The magic synergy in Habit Rouge, a combination of resins and tree gums such as benzoin and opoponax, creates the photographic effect of a hazy glow all around the subject in an old black & white photograph. These resinous scents have the ability to deepen the voice, the equivalent of a lion's growl reverbrating over many kilometres to effortlessly mark its territory. Those elements form the basic oriental core of this formal, somewhat flamboyant but ultimately humanly sensual fragrance, lifted by traditional citrus notes in the opening (lemon, bergamot and mandarin alongside orange blossom) to mirror the idea in Shalimar, deepened with the spicy notes of cinnamon and carnation and burnished by the pungency of a little leather, which takes on suede smoothness rather than harsher or fetishistic nuances of hard-core leather fragrances. The whole smells like sweet orange talc, powdery and somewhat sweet. Habit Rouge is mature and dense, yes, but such a wonderful aristocratic classic that its acquaintance simply should be made by younger generations. On a woman, it can be deeply alluring! Habit Rouge follows the Vetiver presentation until 2000. (This was the year the latter changed its looks dramatically) Habit Rouge took the simple travel container and red-capped sixties style atomizers. In 1988 it changed into the briefcase-inspired Eau de Toilette flacon design by Robert Granai. It has stayed there ever since, its red label modernised by a slight simplification. 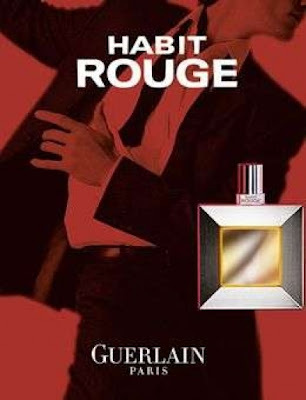 Habit Rouge was recognisably reformulated in 2003, as evidenced by the change in packaging, coinciding with the launch of the Eau de Parfum concentration. It's still a great fragrance however in all its forms and worth chewing one's teeth on, man or woman. Comparing Eau de Parfum (one of the rare masculine fragrances to come in such a concentration) to the most well-known form of Habit Rouge, the long-standing Eau de Toilette, the two almost overlap in the initial 20 minutes, with the citrus & orange blossom notes lingering somewhat more in the EDP. But after that phase the two diverge, with the EDP losing the orange blossom (which can give a soapy, clean feel), becoming spicier and muskier as it dries down with the addition of a modern "oud" note and a chocolate tinge, while the EDT retains the lighter "flou" character all the way through, making the EDT the perfect signature scent choice for any time, with the EDP being a bit heavier and therefore more reserved for formal evenings. It's also the most "modern" of all concentrations, somewhat skewing the retro feel of the Habit Rouge fragrance, so purists might want to consider that. The Eau de Toilette boast a big lemon-neroli accord o in the beginning and a soft, smooth suede note in the background, while on the whole it's the most powdery/dusty incarnation of the fragrance. If you can find it, buy the limited edition Habit Rouge Parfum which tones down the powder and "cleaner" qualities in favour of a muskier, more leathery and camphor-nuanced scent like the vintage Shalimar meets Vol de Nuit. Of special note is the traditional and vintage Eau de Cologne concentration, the original thing, which is the least "dusty" for those concerned with the powdery aspect of the scent, becoming crisper and more flesh-like vanilla oriental. The sensual aura of the Habit Rouge Eau de Cologne is surprisingly lasting, easily 6 hours on skin and therefore this is a concentration to acquaint yourself with if you're serious about perfume. Habit Rouge also circulates in various limited editions (Beau Cavalier etc), on which we have posted news on these pages. According to Mr.Guerlain the batches come from: 1965, Dry '67, EdT '88, EdP 2003, Légère '05, Parfum '08, Sport '09, and L'Eau '11. You can watch the official Habit Rouge L'Eau clip here. Base Note: Vanilla, Amber, Leather, Benzoin, Labdanum, Olibanum, Sandalwood, Leather accord. Having heard so much about Habit Rouge, I tested this for the first time on Monday. My initial thought was "candy! ", and then, "lemon drops!". LOL, I apologize for my very unsophisticated take on this classic. I was expecting a typical men's leathery cologne, and found it much sweeter than expected. It would not be too masculine for a woman to wear. Will test again, and try to come up with a more in-depth assessment! it's been changed somewhat from what is considered "the classic" and it all depends on what you tested. Modern EDT? I tried this the other day and it was okay. I didn't swoon but if I got a bottle, I wouldn't mind. But... mixed with Messe de Minuit, that's another story. I highly recommend trying. I love this fragrance!It is so spicy, so masculine!Simply irresistible!I found it at Heathrow's airport last week and I bought it!Thank you Elena for this excellent review! My husband's got two bottles, one silver capped and one gold. The gold capped one was the earlier purchase and is much nicer. (I bought him the second because of reformulation fears, and ended up getting something inferior anyway!) There's a similar 'sicky' note in the silver-topped one to the note I get from reformulated Shalimar. Fine after a while, but unpleasant for the first five minutes or so. Elena, it was the modern EDT that I tested. Wouldn't be surprised if, in reformulation, the lighter elements were left in, and the most interesting parts (leather, skank) were removed. since there are "year 1996" and "year 2000" version ( at least as "copyright by Guerlain" written on the box: both are rectangular "Eau de Toilette" bottles) of Habit Rouge, I would like to know if there are differences between these 1996 and 2000 versions, and the "after 2003" one described in your excellent article. thanks for commenting and good question! The "copyright by Guerlain" on boxes refers to the design of the packaging. It does not refer to reformulation of juice inside and therefore it can be or it can't be relevant, as each case dictates in the Guerlain catalogue of scents. In what concerns HR, the changes happened in earnest in 2003 (and after that in about 2008-9). The two older formulations are close enough not to necessitate any panic in the hearts of fans. Just received some HR in the new EDP for Christmas. My last bottle had been of the EDT in the 1990's. This new EDP is very different indeed, and reminds me in no way of the stuff I used to know. It used to be more patchouly and rosewood strong, and the drydown had a "cozy", "Art Deco powder" quality that is simply not here now. The leather note in the new EDP is completely different from the old one. This new version also has a sharp "vegetal" coriander/carrot note in the midrange that frankly does not please me much. This new version contains a synthetic "stony" note that I recognize from TERRE D'HERMES. If it sounds like I am having a bit of buyer's remorse, you are not incorrect.